MOUNTAIN VIEW OR PEACEFUL PARK? YOUR PERFECT SPOT IS HERE. Whether you would like a move-in-ready home or a blank slate on which to build your dreams, we have terrific options. Please click the available lots on the map to view more details. Prices listed do not include GST and are subject to change. Rancher with full basement and suite potential. This house has it all! Great layout for this 4 bedroom, 4 bathroom house located on a quiet street in Sendero Canyon. The kitchen, living and dining areas are open and bright and beautifully finished with direct access to the covered patio leading to the fully landscaped backyard. The upper level features a large master suite with a walk in closet and a 5 pc luxurious bathroom with stand alone tub and a 6ft x 6ft custom walk in shower plus another 2 bedrooms, and additional bathroom. The lower floor contains two bedrooms, 4 pc bathroom, huge family room and a separate entrance. Other Notable features include double car garage, floor to ceiling stone fireplace, hot-water on demand, 2 dishwashers and a wine fridge. Many more extra's added over and above Sendero Canyon specifications. GST is applicable phone Listing Representative to arrange for your private viewing. All measurements approximate Buyer to verify. Amazing layout with great views from this rancher with a full basement. Almost 3200 sq ft fully finished plus a generous size double door garage with all the primary living on the main floor. Nine foot ceilings help provide plenty of natural light, plus the Sendero signature tray ceilings in the master bedroom and the great room create unique looking spaces. South facing back yard will allow for plenty of sunshine, and 3 large bedrooms on the lower level will leave room for all the kids or company. GST is applicable on the purchase price. Creative design to maximize the stunning views from this brand new walk out rancher in Sendero Canyon. Massive southwest facing, partially covered deck that looks out over the city and all the way to Skaha Lake helping create plenty of peaceful outdoor living space. Huge master suite on the main floor, along with an open concept living area with a cozy fireplace and a functional kitchen. The lower level is bright and open containing 2 bedrooms, bathroom, laundry room and a rec room - lots of room for the pool table here. House is currently under construction so there is still time to choose your finishing color scheme or make some minor changes. GST is applicable. Fantastic views, plenty of space and high quality construction - we may have just found your new home. Construction has begun on this walk out rancher in Sendero Canyon with an open concept living area on the main floor with plenty of windows to highlight the views of the city and valley below. The daylight basement contains three large bedrooms, a massive rec room plus 2 more bathrooms. Six appliances included in the purchase price, solid surface counters in the kitchen, high quality flooring and fixtures throughout the house, with a finishing palette already chosen from one of our designer inspired schemes. This brand new home is covered by the 2/5/10 new home warranty, GST is applicable. Beautiful rancher with fully finished basement in Sendero Canyon Penticton. Enjoy great curb appeal and quality finishes for this 2575 square-foot, 4 bedroom plus den home with a double car garage. The open and bright main floor offers living on one level with a large master bedroom accompanied by a five piece ensuite and a generous walk-in closet. The finished basement offers 3 bedrooms, 4 piece bathroom, large family room, and plenty of extra storage. Other notable features include quartz countertops and soft close kitchen doors and drawers, gas fireplace, tray ceilings, fully landscaped and fenced yard. GST is applicable. Beautiful rancher with fully finished basement in Sendero Canyon Penticton. Enjoy great curb appeal and quality finishes for this 2800 square-foot, 5 bedroom home with a double car garage. The open and bright main floor offers living on one level with a large master bedroom accompanied by a five piece ensuite and a generous walk-in closet. The basement is super versatile giving you the option for a legal one or two bedroom suite (additional costs apply). 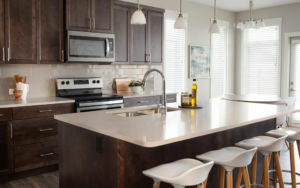 Other notable features include quartz countertops and soft close kitchen doors and drawers, gas fireplace, tray ceilings, fully landscaped and fenced yard. GST is applicable. Beautiful rancher with fully finished basement in Sendero Canyon Penticton. Enjoy great curb appeal and quality finishes for this 2800 square-foot, 5 bedroom home with a double car garage. The open and bright main floor offers living on one level with a large master bedroom accompanied by a five piece ensuite and a generous walk-in closet . The basement is super versatile giving you the option for a legal one or two bedroom suite (additional costs apply). 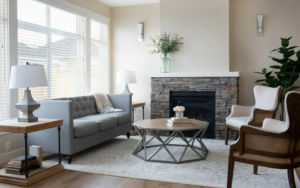 Other notable features include quartz countertops and soft close kitchen doors and drawers, gas fireplace, tray ceilings, fully landscaped and fenced yard. GST is applicable. For those who looking to by live by the motto "Less is More", this single level home is perfect. This 1,770 sq ft true rancher boasts bright and open living on one level plus a generous size double car garage. Notable features include quartz kitchen countertops and soft close drawers and doors, stone and mantle gas fireplace, tray ceilings, oversized windows, completely landscaped and fenced back yard all included in the price. Enjoy the ease of condo living without compromising on space or having to live by strata rules. BONUS Side alley access gives you the option for RV, Boat and toy parking. Enjoy Sendero Canyon's reputation for homes with great curb appeal and quality construction and finishes. GST is applicable. One of our most popular layout is this 2469 sq ft rancher with full basement located on the quiet crescent in Sendero Canyon. All the important living on the main floor with a large master suite, kitchen, living, room and laundry. Fully finished basement with another three bedrooms, 5 piece bathroom plus a rec room and storage. Price includes appliances and a landscaping budget, GST is applicable however qualified purchasers are exempt from the Property Transfer Tax. All the important living on the main floor with a large master suite, kitchen, living, room and laundry. The lower level has an outside entrance providing the ability to add an income producing suite or simply have three additional bedrooms and a rec room for the house - plenty of time to choose the finishing color package as well. Price includes appliances and a landscaping budget, GST is applicable however qualified purchasers are exempt from the Property Transfer Tax. Plenty of space inside and out with open concept living, attached double garage and 2489 sq ft finished. All the important living on the main floor with a large master suite, kitchen, living, room and laundry. Fully finished basement with another three bedrooms, 4 piece bathroom plus a rec room and storage. Price includes appliances and a landscaping budget, GST is applicable however qualified purchasers are exempt from the Property Transfer Tax. Amazing views from this walk out rancher in Phase three of Sendero Canyon. Designed with main floor living in mind, this home contains a an open concept living area focused on the views, plus a large master suite, laundry area, second bedroom and a den all on the main floor. The lower level contains three more bedrooms, along with an exercise area, large rec room and a games room with glass doors heading out to the yard. GST is applicable, and still plenty of time to choose your color scheme from one of our designer inspired palettes. Amazing views from this walk out rancher in Phase three of Sendero Canyon. Designed with main floor living in mind, this home contains a an open concept living area focused on the views, plus a large master suite, laundry area, second bedroom and a den all on the main floor. The lower level has plenty of space for the whole family, or room to add an income producing suite. GST is applicable, and still plenty of time to choose your color scheme from one of our designer inspired palettes. Perhaps the best view in Sendero Canyon from this walk out rancher on a lot measuring over 13000 Sq Ft. One of our most popular floor plans with oversized windows allowing plenty of natural light to seep in, massive kitchen and living area plus 26 by 12 partially covered deck to enjoy the outdoor living that draws us to the Okanagan. Master suite on the main floor with a custom tiled shower in the en suite bathrooms, plus another two large bedrooms on the lower level with glass doors leading out to the spacious yard. GST is applicable, and still plenty of time to choose your color scheme from one of our designer inspired palettes. With over 3700 sq ft of living space in this massive home on a corner lot, you will have plenty of room for the whole family in the new build at Sendero canyon. Construction is under way with a completion date set for the spring of 2019 - still plenty of time to choose your color scheme from one of our designer inspired palettes. 3 large bedrooms on the main floor, plus a huge open concept living area designed to take in the views and receive the afternoon sun through the oversized windows. The lower level has a few different options including the ability to add a two bedroom legal suite to the house - this works great for extended family or simply to generate additional income. Two Storey home with bedrooms up and suite potential with views over the city located on a quiet cul de sac. "Lifestyle, location, convenience" Amazing brand new 5 bedroom rancher under construction with a fully finished basement. Located on quiet Sendero Crescent this home has impressive curb appeal with a perfect balance of stone, timbers and fiber cement shakes. Suitable for families and empty nesters who need space and living all on one level. Some notable features include double car garage, quartz countertops, soft close kitchen drawers and doors, cultured stone and timber gas fireplace, 12 ft tray ceilings, oversized windows, beautiful 4 piece en-suite to name a few. Construction is scheduled to be complete near the end of 2018. GST is applicable on the purchase price however a qualified purchaser may be partially exempt from property transfer tax. "Lifestyle, location, convenience" Amazing brand new 4 bedroom plus den rancher under construction with a fully finished basement. Located on quiet Sendero Crescent this home has impressive curb appeal with a perfect balance of stone, timbers and fiber cement shakes. Suitable for families and empty nesters who need space and living all on one level. Some notable features include double car garage, quartz countertops, soft close kitchen drawers and doors, cultured stone and timber gas fireplace, 12 ft tray ceilings, oversized windows, beautiful 4 piece en-suite to name a few. Construction is scheduled to be complete near the end of 2018. GST is applicable on the purchase price however a qualified purchaser may be partially exempt from property transfer tax. One level living at its finest in this 3 bed, 2 bath rancher with unique and creative architecture that will take advantage of the nice views out over the mountains. A large master suite with walk in closet and 5 piece en suite bathroom plus a massive great room for perfect open concept living. The oversized garage is 600 sq ft, and plenty of space in the fully landscaped yard. This home is currently under construction and is scheduled for completion in early 2019. GST is applicable, however qualified purchasers will be exempt from the property transfer tax. "Lifestyle, location, view" Amazing brand new rancher under construction with a fully finished daylight basement. Located on quiet Sendero Crescent this home has impressive city, mountain and lake views and is one of Sendero Canyon's most versatile designs. Suitable for families & empty nesters who need space and living all on one level. Additionally you can take advantage of the option to upgrade to a 2 bedroom legal suite to create a great income stream or have it designed for a suite in the future. Some notable features include double car garage, quartz countertops, soft close kitchen drawers and doors, cultured stone and timber gas fireplace, 12 ft tray ceilings, oversized windows, beautiful 5 piece en-suite to name a few. Construction is scheduled to be complete near the end of 2018. GST is applicable on the purchase price however a qualified purchaser may be partially exempt from property transfer tax. "Lifestyle, location, view" Amazing brand new rancher under construction with a fully finished daylight basement. Located on quiet Sendero Crescent this home has impressive city and mountain views and is one of Sendero Canyon's most versatile designs. Suitable for families and empty nesters who need space and living all on one level. Additionally you can also take advantage of the option to upgrade to a 2 bedroom legal suite to create a great income stream. Some notable features include double car garage, quartz countertops, soft close kitchen drawers and doors, cultured stone and timber gas fireplace, 12 ft tray ceilings, oversized windows, beautiful 5 piece en-suite to name a few. Construction is scheduled to be complete near the end of 2018. GST is applicable on the purchase price however a qualified purchaser may be partially exempt from property transfer tax. Come visit the Sendero team at our show home open daily except Tuesdays from 12pm to 4pm. "Lifestyle, location, view" Amazing brand new rancher under construction with a fully finished daylight basement. Located on quiet Sendero Crescent this home has impressive city and mountain views and is one of Sendero Canyon's most versatile designs. Suitable for families and empty nesters who need space and living all on one level. Additionally you can also take advantage of the option to upgrade to a 2 bedroom legal suite to create a great income stream. Some notable features include double car garage, quartz countertops, soft close kitchen drawers and doors, cultured stone and timber gas fireplace, 12 ft tray ceilings, oversized windows, beautiful 5 piece en-suite to name a few. Construction is scheduled to be complete near the end of 2018. GST is applicable on the purchase price however a qualified purchaser may be partially exempt from property transfer tax. "Perfect Family Home in an Amazing Location". Under construction in Phase 3 Sendero Canyon, this 2 storey, 5 plus bedroom home with fully finished basement has it all including great Valley and Mountain views. The main floor boasts a perfectly designed open and bright concept with Sendero's best and largest kitchen design. Upstairs are 3 generous size bedrooms including a huge master bedroom with a 5 piece ensuite and large laundry room. The basement will not disappoint, nicely finished with 2 bedrooms, family area and media room. Notable features include quartz countertops, soft close kitchen drawers and doors, cultured stone and timber gas fireplace, 12 ft tray ceilings, oversized windows to name a few. Construction is scheduled to be complete near the end of 2018. GST is applicable on the purchase price however a qualified purchaser may be partially exempt from property transfer tax. Amazing layout with great views from this rancher with a full basement. Almost 3300 sq ft plus a generous sized 612 sq ft garage with all the primary living on the main floor. Nine foot ceilings help provide plenty of natural light, plus the Sendero signature tray ceilings in the master bedroom and the great room create unique looking spaces. South facing back yard will allow for plenty of sunshine, and 3 large bedrooms on the lower level will leave room for all the kids or company. This house is scheduled for completion in early 2019. GST is applicable on the purchase price. Amazing views from this walk out rancher on Sendero Crescent with the potential of a 2 bedroom, income producing suite in the lower level. Two bedrooms on the main floor, including a large master suite with a walk in closet and 4 pc bathroom plus open concept living areas that lead out to the west facing rear deck. The lower floor provides a few options - either 3 large bedrooms, full bathroom and a rec room, or keep one bedroom for the main house and create a mortgage helping, self contained secondary suite. Attached double garage, appliances and landscaping included, with the house scheduled for completion in early 2019. GST is applicable on the purchase price however qualified purchasers may be partially exempt from the property transfer tax. Great layout in this 5 bedroom, 4 bathroom house located on a quiet cul de sac in Sendero Canyon. The large kitchen, living and dining areas have large windows with direct access to the covered patio leading to the fully landscaped back yard. The upper level features a large master suite with a walk in closet and 5 pc bathroom, plus another 2 bedrooms, second bathroom and the laundry area. The lower floor contains two more bedrooms, a full bathroom plus a rec room and media room. Attached double garage, appliances included with the house scheduled for completion in early 2019. GST is applicable on the purchase price. Located on a quiet street in Sendero Canyon, lies this rancher with a full basement. Featuring 5 bedrooms and 3 full bathrooms along with an attached double garage plus a fully landscaped and fenced yard. The main floor contains an open concept living area, master suite with 4 pc bathroom and walk in closet, laundry and an additional bedroom near the front entrance. The lower level has three more bedrooms, a full bathroom and a large rec room. House is currently under construction with completion scheduled for early 2019. GST is applicable on the purchase price however qualified purchasers will be exempt from the property transfer tax. Main level living at its finest in a brand new home in Sendero Canyon. With over 2500 sq ft, there is plenty of room in this rancher with a full basement - large master bedroom with a 5 pc en suite bathroom, open concept living and a comfortable back yard. The lower level features 3 more bedrooms (2 with walk in closets) and a large rec room. Price includes landscaping and appliances, with GST being applicable on the purchase price however qualified purchasers will be exempt from the property transfer tax. Show home is open every day except Tuesday between noon and 4. Main level living at its finest in a brand new home in Sendero Canyon. With almost 2700 sq ft, there is plenty of room in this rancher with a full basement - large master bedroom with a 5 pc en suite bathroom, open concept living and a comfortable back yard. The lower level features 3 more bedrooms (2 with walk in closets) and a large rec room. Price includes landscaping and appliances, with GST being applicable on the purchase price however qualified purchasers will be exempt from the property transfer tax. The most spectacular home offered by Sendero Canyon Penticton. This luxury home has amazing southern exposure perched on a almost 1/2 acre lot. The stunning lake, city and valley views are complimented by this home being located at the end of a quiet crescent. The visually stunning exterior has a perfect blend of timbers, stone, shake, composite siding, and 2 handsome doors for the triple car garage. The home was designed with everyone in mind including a master wing on the main floor for one level living. The open concept layout includes folding doors maximizing the use of the 1300 sq ft of covered outdoor living area. Upstairs privately accommodates 2 bedrooms or a cool office area. The bright and functional walkout basement has an additional 2 large bedrooms, a massive family room and 200 sq ft of storage. Some notable features include quartz countertops, soft close kitchen drawers and doors, cultured stone and timber gas fireplace. GST is applicable. Great views out over the city from this walk out rancher located in popular Sendero Canyon. Large master bedroom with walk in closet and 5 piece en suite bathroom, open concept living with the kitchen/living/dining rooms all connected while facing the oversized windows leading out to the partially covered west facing deck. Two more bedrooms, full bathroom, large rec room plus a perfect gym area make up the lower level. Scheduled for completion in April of 2018, still plenty of time to choose your finishing palette. Show home on site is open every day except Tuesday from noon to 4. Still time to choose your colours on this 2570 sq ft rancher with full basement located on the quiet crescent in Sendero Canyon. All the important living on the main floor with a large master suite, kitchen, living, room and laundry. Fully finished basement with another two bedrooms, 4 piece bathroom plus a rec room and gym area. Price includes appliances and a landscaping budget, GST is applicable however qualified purchasers are exempt from the Property Transfer Tax. Visit us at the show home that is open every day except Tuesday between noon and 4. Our Vida homes are not to be missed, and are a tremendous value for a brand new home. These are ready for whatever path your life might take: a growing family, easing into retirement, or seeking the joy of a simplified day-to-day. As open-concept two-level ranchers (Master on main), they offer the possibility of single-floor living, but with the added flexibility of space below for kid's rooms, hobbies, guests-whatever suits your life right now. Enjoy the privacy, generous square footage and garden space of a detached home with Sendero quality finishing. Price includes appliances and a landscaping budget, GST is applicable however qualified purchasers are exempt from the Property Transfer Tax. House under construction, show home at Sendero open noon to 4 every day except Tuesday. Our Vida homes are not to be missed, and are a tremendous value for a brand new home. These are ready for whatever path your life might take: a growing family, easing into retirement, or seeking the joy of a simplified day-to-day. As open-concept two-level ranchers (Master on main), they offer the possibility of single-floor living, but with the added flexibility of space below for kid's rooms, hobbies, guests-whatever suits your life right now. Enjoy the privacy, generous square footage and garden space of a detached home with Sendero quality finishing. Price includes appliances and a landscaping budget, GST is applicable however qualified purchasers are exempt from the Property Transfer Tax. All Measurement are approximate. Buyer to verify if important. Visit our show home at Sendero open noon to 4 every day except Tuesdays. Our Vida homes are not to be missed, priced at half of what you might expect. These are ready for whatever path your life might take: a growing family, easing into retirement, or seeking the joy of a simplified day-to-day. As open-concept two-level ranchers (Master on main), they offer the possibility of single-floor living, but with the added flexibility of space below for kid’s rooms, hobbies, guests—whatever suits your life right now. Enjoy the privacy, generous square footage and garden space of a detached home with Sendero quality finishing. One level living at it's finest in Penticton's most popular new community, Sendero Canyon. Plenty of space in this 3 bedroom, 2 bathroom rancher with over 1900 sq ft and a triple garage offering 770 sq ft - plenty of room for all the toys. This wonderful home is currently under construction with plenty of time left to choose your colors using the same quality finishing Sendero has become known for. Visit us at the show home every day except Tuesday between noon and 4 for additional information. For those who live by the motto “Less is More”, these single-level homes are ideal: spacious open-plan layouts with the serenity of a private outdoor garden—all the ease of condo living without compromising on space or having to live by strata rules. You’ve refined your life to this point. Time to sit back and look forward to blissfully simple living. Great layout on this 1642 sq ft spacious 2 bed pus den/2 bath home with the quality finishing you have come to expect at Sendero Canyon. Prices include GST, and you can visit us at the show home that is open every day except Tuesday between noon and 4. For those who live by the motto “Less is More”, these single-level homes are ideal: spacious open-plan layouts with the serenity of a private outdoor garden—all the ease of condo living without compromising on space or having to live by strata rules. You’ve refined your life to this point. Time to sit back and look forward to blissfully simple living. Great layout on this 1522 square foot 2 bed/2 bath home with the quality finishing you have come to expect at Sendero Canyon. GST is applicable, and you can visit us at the show home that is open every day except Tuesday between noon and 4. Our Ventura homes are not to be missed. These are ready for whatever path your life might take: a growing family, easing into retirement, or seeking the joy of a simplified day-to-day. As open-concept single-level ranchers, they offer the possibility of single-floor living, without sacrificing the flexibility of space for kid's rooms, hobbies, guests-whatever suits your life right now. Enjoy the privacy, generous square footage and garden space of a detached home with Sendero quality finishing. Price includes appliances and a landscaping budget, GST is applicable however qualified purchasers are exempt from the Property Transfer Tax. House under construction, show home at Sendero open noon to 4 every day except Tuesday. Our Ventura homes are not to be missed, and are a tremendous value for a brand new home. For those who live by the motto "Less is More", these single-level homes are ideal: spacious open-plan layouts with the serenity of a private outdoor garden - all the ease of condo living without compromising on space or having to live by strata rules. Enjoy the privacy, generous square footage and garden space of a detached home with Sendero quality finishing. Price includes appliances and a landscaping budget, GST is applicable however qualified purchasers are exempt from the Property Transfer Tax. All Measurement are approximate. Buyer to verify if important. Visit our show home at Sendero open noon to 4 every day except Tuesdays. With one of the most unique floor plans in the exciting phase two of Sendero Canyon, this walk out rancher will be attractive to a large number of purchasers. The main floor features a vaulted entry that leads to the open concept great room featuring large windows to enjoy the mountain and city views below. The 675 sq ft master suite is all that you will find on the upper level, creating the perfect escape for absolute privacy. The spa like en suite bathroom has two sinks, separate walk in shower and large soaker tub underneath a bay of windows to drink in the views. The lower level has another two bedrooms plus a rec room that leads on to the covered deck and into the back yard. This lot is located at the end of the road, so you will only have one neighbor to the south and undisturbed, natural landscaping to the north. This home is scheduled for completion in the fall of 2017 - still time to help choose some of the color options!! Introducing this amazing 3296 sqft Walk - Out rancher in Phase II, Sendero Canyon. Permits have been submitted and will be under construction soon. This affordable luxury home has quality finishing throughout, with attention paid to every detail throughout the entire process. Features include quartz counter-tops, soft close drawers, fully finished basement, cultured stone gas fireplace, oversized windows, 12 ft. tray ceilings, roughed in security system. GST is included in price along with a landscaping allowance plus all your appliances. Feel secure with a 2-5-10 Warranty through Travelers. Show home is open every day except Tuesday from noon to 4, come and see what is creating all the excitement. Phase II, Sendero Canyon's brand new 2700 sqft Walk out Rancher, currently under construction and has a fantastic lot location. Affordable luxury home has quality finishing throughout, with attention paid to every detail throughout the entire process. Features include quartz counter-tops, soft close drawers, fully finished basement, cultured stone gas fireplace, oversized windows, 12 ft. tray ceilings, roughed in security system. Price includes appliances and a landscaping budget, GST is applicable however qualified purchasers are exempt from the Property Transfer Tax. Feel secure with a 2-5-10 Warranty through Travelers. Show home is open every day except Tuesday from noon to 4, come and see what is creating all the excitement. "Winning Combination for All Families". Phase 2 Sendero Canyons brand new rancher with daylight basement is currently under construction. An amazing bright and open layout with the option of living all on one level. This home features 5 bedrooms with 3 bathrooms. Buyers have the option to include a 2 bedroom suite to the home to help subsidize the mortgage payments. Brand new is an option with the rental income! Some notable features include quartz countertops, soft close kitchen drawers and doors, cultured stone and timber gas fireplace, 12 ft tray ceilings, over-sized windows, beautiful 4 piece en-suite. BONUS GST included in purchase price and qualified Buyer(s) do not pay any Property Transfer Tax on newly constructed homes (Buyers to verify). Phone listing representatives for a private personal tour of all options in Sendero Canyon and an explanation of how income suites assist you in purchasing a single family home at Sendero Canyon. Introducing this amazing 3204 sqft Walk - Out rancher in Phase II, Sendero Canyon. Permits have been submitted and will be under construction soon. This affordable luxury home has quality finishing throughout, with attention paid to every detail throughout the entire process. Features include quartz counter-tops, soft close drawers, fully finished basement, cultured stone gas fireplace, oversized windows, 12 ft. tray ceilings, roughed in security system. GST is included in price along with a landscaping allowance plus all your appliances. Feel secure with a 2-5-10 Warranty through Travelers. Show home is open every day except Tuesday from noon to 4, come and see what is creating all the excitement. Your Best Move Ever". Phase 2 Sendero Canyons brand new rancher with daylight basement is currently under construction. The bright open and functional main floor has over 400 sq ft of covered deck. The fully finished daylight basement offers many uses with the option to include a 2 bedroom legal suite. Some notable features include quartz countertops, soft close kitchen drawers and doors, cultured stone and timber gas fireplace, 12 ft tray ceilings, over-sized windows, beautiful 4 piece en-suite and a beautiful blend of stone, timbers and shake for the exterior finish. Enjoy a 2-5-10 home warranty package and avoid the risk of an older home. GST applicable. Phone listing representatives for a private personal tour of all options in Sendero Canyon and an explanation of how income suites assist you in purchasing a single family home at Sendero Canyon. Introducing this amazing 2700 sq ft Walk - Out rancher in Phase II, Sendero Canyon. Permits have been submitted and construction is underway with completion set for April 2018. This affordable luxury home has quality finishing throughout, with attention paid to every detail throughout the entire process. Features include quartz counter-tops, soft close drawers, fully finished basement, cultured stone gas fireplace, oversized windows, 12 ft. tray ceilings, roughed in security system. Price includes appliances and a landscaping budget, GST is applicable however qualified purchasers are exempt from the Property Transfer Tax. Feel secure with a 2-5-10 Warranty through Travelers. Show home is open every day except Tuesdayfrom noon to 4, come and see what is creating all the excitement. Exquisite and Unique". Currently under construction 4 bedroom sprawling rancher with walkout basement and large double car garage just released in Phase 2 Sendero Canyon Penticton. 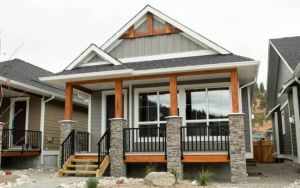 The exterior details of stone, timbers and shake give this home incredible curb appeal while the interior is guaranteed not to disappoint with an amazing bright and open layout. Some notable features include quartz countertops, soft close kitchen drawers and doors, cultured stone and timber gas fireplace, 12 ft tray ceilings, oversized windows, beautiful 5 piece en-suite to name a few. This home has exceptional views of Sendero Canyon and benefits from late evening sun. Enjoy a 2-5-10 home warranty package and avoid the risk of an older home. GST applicable. Phone LR for a private personal tour of all options in Sendero Canyon. There will be a beautiful craftsman style two storey 2639 sqft home on this very desirable lot in Phase II at Sender Canyon. Permits have been submitted and will be under construction soon. This affordable luxury home will have quality finishing throughout, with attention paid to every detail throughout the entire process. Features include quartz counter-tops, soft close drawers, fully finished basement, cultured stone gas fireplace, oversized windows, 12 ft. tray ceilings, roughed in security system. GST is included in price along with a landscaping allowance plus all your appliances. Feel secure with a 2-5-10 Warranty through Travelers. Show home is open every day except Tuesday from noon to 4, come and see what is creating all the excitement. One of the more popular options in Sendero Canyon has been this craftsman style, two storey 2639 sq ft home so we have decided to build another one in phase two. House is completed and available for immediate occupancy. The massive kitchen, and open concept main floor living space will be great for entertaining with the large glass door leading out to the patio and rear yard that backs on to city parkland. Three large bedrooms upstairs, plus an oversized family room and the laundry room. Features include quartz counter-tops, soft close drawers, fully finished basement, cultured stone gas fireplace, oversized windows, 12 ft. tray ceilings, roughed in security system. GST is applicable. Landscaping allowance plus all your appliances are included. Feel secure with a 2-5-10 Warranty through Travelers. Show home is open every day except Tuesday from noon to 4, come and see what is creating all the excitement. "Winning Combination for a family". Under construction in phase 2 Sendero Canyon and ready for Fall 2017 is this excellent and best selling family home design. The main floor is bright and beautiful with an enormous kitchen and living area perfect for entertaining. All the bedrooms are on the upper level including a huge family room making this perfectly suited for the growing family. Some notable features include quartz countertops, soft close kitchen drawers and doors, cultured stone and timber gas fireplace, 12 ft tray ceilings, over-sized windows, beautiful 4 piece en-suite and generous walk-in closet to name a few. This home backs on to City of Penticton Park land. BONUS GST included in purchase price and qualified Buyer(s) do not pay any Property Transfer Tax on newly constructed homes (Buyers to verify). Enjoy a 2-5-10 home warranty package and avoid the risk of an older home. Phone listing representatives for a private personal tour of all options in Sendero Canyon. This is a beautiful modern craftsman style Rancher, 3221 sqft, on this very desirable lot in Phase II at Sendero Canyon. This affordable luxury home will have quality finishing throughout, with attention paid to every detail throughout the entire process. Features include quartz counter-tops, soft close drawers, fully finished basement, cultured stone gas fireplace, oversized windows, 12 ft. tray ceilings, roughed in security system. Fully landscaped, appliances included - this home is ready for immediate occupancy. GST is applicable, and qualified purchasers will be exempt from the Property Transfer Tax. Feel secure with a 2-5-10 Warranty through Travelers. Show home is open every day except Tuesday from noon to 4, come and see what is creating all the excitement. "Pure Family Luxury in an Amazing Parkside Locale". Just released in Phase 2 Sendero Canyon and ready to be move into for Fall 2017. This spacious 4 bedroom plus den rancher with a fully finished basement backs onto city parkland. This design is versatile for all types of homeowners, suitable for young and older family's along with empty nesters. The interior is guaranteed not to disappoint with an amazing bright and open layout. Some notable features include over-sized garage, quartz countertops, soft close kitchen drawers and doors, cultured stone and timber gas fireplace, 12 ft tray ceilings, over-sized windows, beautiful 5 piece en-suite to name a few. Enjoy a 2-5-10 home warranty package and avoid the risk of an older home. GST applicable. Phone listing representatives for a private personal tour of all options in Sendero Canyon. All your primary living space on the main floor, plus a full basement in this over 2800 sq ft rancher in Sendero Canyon's phase two. Open concept living leading out to a partially covered deck, and right into your back yard that will be backing on to city parkland. Master bedroom on the main floor, plus an additional three bedrooms and a large rec room in the basement. Features include quartz counter-tops, soft close drawers, fully finished basement, cultured stone gas fireplace, oversized windows, 12 ft. tray ceilings, roughed in security system. Price includes appliances and the landscaping is complete as this home is ready for immediate occupancy, GST is applicable however qualified purchasers are exempt from the Property Transfer Tax. Feel secure with a 2-5-10 Warranty through Travelers . Brand New gorgeous 2670 sq ft home in Phase II, Sendero Canyon. Currently under construction and will be completed by August 2017. Beautifully finished craftsmen/contemporary home has quality finishing throughout, with attention paid to every detail throughout the entire process. Features include quartz counter-tops, soft close drawers, fully finished basement, cultured stone gas fireplace, oversized windows, 12 ft. tray ceilings, roughed in security system. GST is included in price along with a fully landscaped and fenced yard plus all your appliances. Feel secure with a 2-5-10 Warranty through Travelers . Show home is open every day except Tuesday from noon to 4, come and see what is creating all the excitement. "Stylish spacious living". Currently under construction 3 bedroom sprawling true rancher with triple car garage just released in Phase 2 Sendero Canyon Penticton.The exterior details of stone, timbers and shake give this home incredible curb appeal while the interior is guaranteed not to disappoint with an amazing bright and open layout. Some notable features include quartz countertops, soft close kitchen drawers and doors, cultured stone and timber gas fireplace, 12 ft tray ceilings, oversized windows, beautiful 5 piece en-suite to name a few. This home backs on to City of Penticton Park land. BONUS GST included in purchase price and qualified Buyer(s) do not pay any Property Transfer Tax on newly constructed homes (Buyers to verify). Enjoy a 2-5-10 home warranty package and avoid the risk of an older home. Phone listing representatives for a private personal tour of all options in Sendero Canyon. Beautiful location, right across from the Sendero Canyon park. This two storey home is under construction and set for completion December 2015. Fantastic family design with main level living and bedrooms on upper level. RV parking. Prices include GST. Affordable luxury. This 3 bedroom plus den home is bright and open with silestone counter tops, over sized windows, and a large fenced backyard. Price includes GST! Affordable luxury. This 3 bedroom plus den home is bright and open with silestone counter tops, over sized windows, and a large fenced backyard and triple car garage. Price includes GST! Under Construction: Triple car garage, Open concept main floor living, all 4 bedrooms on upper level, unfinished basement. One of those bedrooms will be a very generously sized master bedroom that has the ensuite with double sink, tub and shower. GST included in price. A sprawling, 3,351 sq ft , rancher includes a fully finished basement, appliances, fencing, washer and dryer, plus a landscaping budget. Price includes GST! This 4 bedroom plus den rancher is bright and open and includes silestone counter tops, over sized windows, and appliances. The south facing living space opens to a beautifully landscaped and irrigated yard. GST included in price. This sprawling 3,144 sq ft home is currently under construction and scheduled to be complete by January 2016. Included is a fully finished basement, appliances, fencing, washer, dryer, plus a landscape budget. If you act soon, there may still be time to assist with the design! Price includes GST. Brand new sprawling rancher with fully finished basement. This open, bright and functional plan is perfect for a family or the empty nester who wants living on all one level with some extra room for over night guests! This craftsman exterior invites you to showcase the stylish finishing including silestone counter tops, over sized windows, 5 piece en-suite and a huge walk in closet. Price includes GST! Sprawling two bedroom rancher with 1,672 sq. ft. of living space. The open and bright main floor is a flawless design with features including quartz counter tops, gas fireplace with culture stone and timber mantle, 12 foot tray ceiling, engineered hardwood floors and a generous size master bedroom with five piece en-suite and walk in closet. GST included! New 1,452 sq. ft. 2 bedroom, 2 bath rancher on a crawl basement. Beautiful open living areas, double tray ceiling and large window in great room. Generous master bedroom with 5 piece en-suite with double sinks. Attached double garage. Fenced and landscaped yard with underground irrigation. GST included. Lot only ready to build your dream home! Soon to be completed 2852 sqft Two Storey Walk Out at Sendero Canyon with 5 bedroom and 3 bathrooms. We will boast about the views from this location as they are simply spectacular. The design of the open concept kitchen and living room has the entire backdrop of the mountains coming through the beautiful windows. Extra-large back deck for afternoon sun. The kitchen is a chefs dream with an impressive amount of Caesarstone countertops, accented with soft close cabinets and cupboards. Plus the walk in pantry is an extra bonus too. Beautifully finished yard and all appliances are included in the price. This home has also been designed to accommodate a two bedroom suite in the walk out basement for an additional cost. All measurements approximate, buyer to verify, prices include GST. Show home is open every day except Tuesday from noon to 4 PM, come and see in person. Offering Sendero Canyons most popular home style. Currently, under construction, this 3000 sqft Rancher with a daylight basement is beautifully designed inside and out, boasting great views of the city and mountains. The exterior details of stone, timbers and shake gives this home stunning curb appeal. The open and bright main floor is a flawless design featuring Quartz countertops, soft close doors and drawers, gas fireplace with cultured stone and timber mantle, 12 ft. Tray ceiling, generous sized master bedroom with 5pc ensuite, walk-in closet and oversized windows. The finished basement is bright and always impresses with an additional 3 large bedrooms, and a big family room, BONUS GST INCLUDED! All measurements approximate and must be verified by Buyer(s). Come visit our show home open 12-4 pm every day except Tuesdays. This 4 bedroom home with detached garage is the perfect balance of affordable luxury and is beautiful inside and out. The entry-level open and bright main floor has living on all one level and features 2 bedrooms on main floor, quartz countertops, 12 ft. tray ceilings, oversized windows, gas fireplace with stone and mantle and a large covered veranda. Included is a fully developed basement with 2 bedrooms,4 piece bathroom, family room and lots of storage. Enjoy a professionally landscaped and irrigated yard and 6 appliances included in the Price. BONUS GST INCLUDED. Visit our multiple show homes every day from 12-4pm except Tuesdays to see why Sendero is the most impressive development in the South Okanagan. Newest addition to our Sendero homes - introducing the Voyager lineup. Vaulted ceilings, open concept, fenced with all appliances included in the price, as well as GST. Fully finished basement incorporates rec room, 2 bedrooms as well as a 4 piece bathroom. Come and experience the lifestyle that this new community has to offer. This home is presently under construction but come visit our Show home noon - 4 every day except Tuesday, and view similar product to see firsthand the quality of build and finishing that goes into every home. Packages available on site. 968 Holden Road is under construction. 2390 sqft Rancher with a fully finished basement and a single car garage. Parks, trails, wonderful new neighborhood are all here waiting for you to discover. Introducing the new Voyager line of homes at Sendero perfect for snow birds looking for that place to always call home! The voyager inspired design is an open concept plan with the master bedroom on the main and a fully finished basement for those who just need the extra space. Low maintenance yard and low maintenance life style. Ask about RV parking. Voyager Price includes GST. Newest addition to our Sendero homes - introducing the Voyager lineup. The main floor features vaulted ceilings with an open concept living area plus a large master suite and a den/second bedroom. The lower level has an additional two bedrooms, and a huge rec room with plenty of natural light that only a walk out rancher can provide. Come and experience the lifestyle that this new community has to offer. This home is presently under construction but come visit our Show home noon - 4 every day except Tuesday, and view similar products to see firsthand the quality of build and finishing that goes into every home. Packages available on site. "LOCATION, LIFESTYLE AND LEISURE!" Introducing Sendero Canyon's Voyager Series. This 4 bed and 3 bath Rancher with a fully finished walkout basement has detached garage and is the perfect balance of affordable luxury. The main floor is open and bright with great city and mountain views featuring vaulted ceilings, quartz countertops, 12 ft. tray ceilings, oversized windows, gas fireplace with stone and mantle and a large covered veranda. The lower level has additional 2 bedrooms, an office and a huge recreational room. Bonus! for an additional cost you can have a legal suite. The purchase price includes 6 appliances and a professionally landscaped and irrigated yard. ANOTHER BONUS GST INCLUDED. Contact Listing Representatives for private viewing and information packages. Amazing views of the city and valley below from this walk out rancher in popular Sendero Canyon. Modern styling, open concept living on the main floor with a spacious master suite all designed to maximize the views. With 9 foot ceilings on the main floor, and 11 foot on the lower level this home will capture plenty of natural light on both the upper a lower decks. An additional 3 bedrooms, full bathroom plus a large rec room make the lower level great for company or the kids. All this with the quality Sendero finishing you have come to expect - visit the show home any day except Tuesday between noon and 4. GST applicable on the purchase price, qualified purchasers will be exempt from the Property Transfer Tax. If you are looking for something less traditional, then take a look at this spectacular view home with nearly 3,000 sq. ft. of sleek modern design! Walls of glass doors opening onto large decks overlooking spectacular valley views, on all 3 levels, will capture your imagination! This home is still under construction so there is still time to assist in the design and make it completely yours! Located on one of Sendero Canyons Premiere view lots, this Brand new 5 bedroom Rancher with basement is an incredibly well thought out design. This home would be suitable for empty nesters who want luxury and living on all one level or a perfect family home with all the right space and breathing room. The exterior details of Stone, timbers and shake gives this home a million dollar curb appeal. The inside will not disappoint with features that include large covered deck, Quartz counter-tops, generous kitchen with soft close drawers and cabinets, gas fireplace with cultured stone and timber mantle, 12 ft tray ceiling highlights and a double car double door garage to name only a few of the stand out details. Enjoy your beautiful yard space that backs onto protected crown land. BONUS GST INCLUDED!. Come visit our show home open 12-4 pm every day except Tuesdays. Beautifully designed 3,244 sq ft rancher on one of the premier lots in Sendero Canyon. Home overlooks the canyon and was designed with many large windows to take it all in! One of the most popular floor plans in Sendero Canyon located on one of our premium lots. Plenty of space for the growing family with 3 large bedrooms upstairs plus a massive family room, all with tremendous views over the canyon below. The main floor features an open concept kitchen/living area with convenient access to the covered deck which leads to the private back yard. The lower level of this home will contain an income producing one bedroom suite, or it could be perfect for extended family. Top it all off with a massive 664 sq ft garage to keep all the toys secure making this home even more attractive. Using the same quality finishing we have come to expect at Sendero Canyon, plus we still have time to choose our colors, flooring, lighting etc. GST applicable, and the show home is open every day except Tuesday between noon and 4. Located on one of Sendero Canyons Premiere view lots, this Brand new 5 bedroom Rancher with basement is an incredibly well thought out design. This home would be suitable for empty nesters who want luxury and living on all one level or a perfect family home with all the right space and breathing room. The exterior details of Stone, timbers and shake gives this home a million dollar curb appeal. The inside will not disappoint with features that include large covered deck, Quartz counter-tops, generous kitchen with soft close drawers and cabinets, gas fireplace with cultured stone and timber mantle, 12 ft tray ceiling highlights and a generous size double car garage to name only a few of the stand out details. Enjoy your beautiful yard space that backs onto protected crown land. Some notable features include quartz countertops, soft close kitchen drawers and doors, cultured stone and timber gas fireplace, 12 ft tray ceilings, and over-sized windows. GST is applicable. Fantastic walk out rancher on a private canyon lot with a two bedroom suite in the lower level. Main floor living paired with amazing views of the canyon and city below, plus a healthy sized back yard and a covered deck help make this popular floor plan attractive. Three bedrooms on the main level, along with an open concept kitchen/living area with large windows that fill the house with natural light. Separate entrance to the legal, mortgage helping basement suite and using the same quality finishing we have come to expect at Sendero Canyon. This home is completed and move in ready - GST applicable, show home is open every day except Tuesday from noon to 4. One of the most popular floor plans in Sendero Canyon located on one of our premium lots. Plenty of space for the growing family with 4 large bedrooms upstairs with tremendous views over the canyon below. The main floor features an open concept kitchen/living area with convenient access to the covered deck which leads to the private back yard. The lower level of this home will contain an income producing two bedroom suite, or it could be perfect for extended family. Top it all off with a massive 691 sq ft triple garage to keep all the toys secure making this home even more attractive. Using the same quality finishing we have come to expect at Sendero Canyon, plus we still have time to choose our colors, flooring, lighting etc. This spectacular bright and open 1615 sq.ft. rancher has a full daylight basement (another 1615 sq. ft) and attached two car garage. Prices include GST.